Ariella has witnessed the destruction of her beloved Jerusalem, the loss of her family, and death of her people. Now a runaway slave, she disguises herself as a male gladiator, fighting for the hope of winning the crowd and her freedom. Wealthy politician Portius Cato, is also running away in a sense–he has left Rome and the political sphere hoping to live a peaceable life in Pompeii as a winegrower, but is immediately caught up in politics as he begins to fight against social injustice and the personal affronts to his family. Cato and Ariella’s paths cross as they separately encounter a group of Christians, and each learn to surrender their individual challenges and stubbornness for a greater hope and purpose. This is the third of Higley’s books that I have read, and while they were all good, I enjoyed this one best. I enjoyed the characters’ personalities, the suspense of knowing that Mt. Vesuvius would erupt at some point in the midst of their plans, and the historical setting of Pompeii, which has always interested me. I connected with Ariella’s strength, Cato’s sense of justice, and the Roman world, which is not far off from our own. 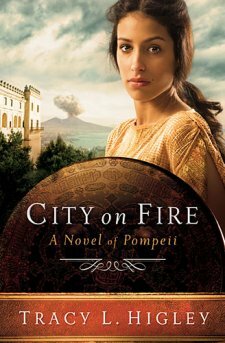 The author also has a very cool website with photos of her journey through Pompeii and the surrounding areas during her research, details about the writing of the book, and all sorts of other things. I love that Higley puts so much thought into portraying the historical elements of the story accurately, and enjoy following her on that adventure.